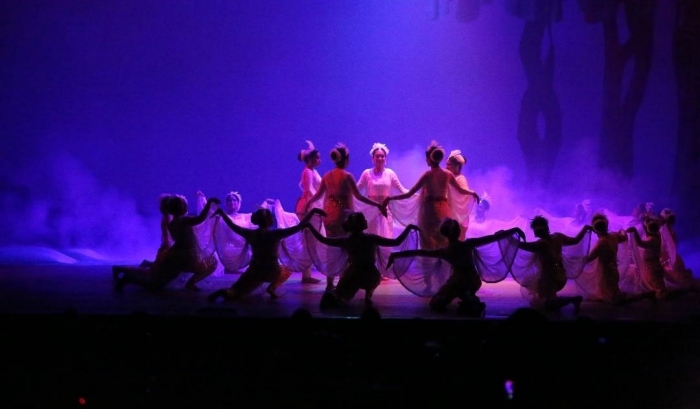 As the curtain goes up, we see 21 swans on the large stage at Chowdaiah hall. Young, beautiful dancers from the Sanjali Centre for Odissi Dance, Bengaluru, immediately bring us to the edge of our seats as they sway to the brilliant music composed by Praveen D Rao. Swan Lake, popular as a Russian ballet, transformed into a gripping Odissi production by the brilliant dancer Sharmila Mukerjee. The one hour packed a lot of emotions in it. The love story has almost all the human emotions woven around it - passion, love, jealousy, and so on. The performance began with the classical sound track of Swan Lake which set the mood for the rest of the simple story. 'Hansika' is about two sisters who are at loggerheads over a handsome prince. Good woman versus the evil woman has a lot of psychological depth and complexity. The life story of Odette and her sister is the story of one virtuous woman becoming a victim of a jealous evil one. Swan Lake was a ballet composed by Russian composer Pyotr Ilyich Tchaikovsky in 1875-76. It revolves around the story of Odette, a Russian princess, who has been transformed into a swan by an evil sorcerer. 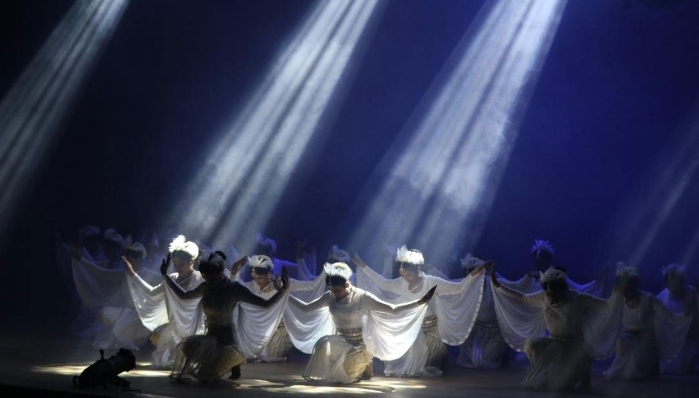 A large number of dancers dressed in white, present an interesting visual with the help of the beautiful backdrop (the forest and the water body) and the occasional shadow at the back, were able to effectively convey the message that be it humans or animals, the emotions are the same. While the dancers danced in Odissi style, there were traces of ballet movements which did not become an aberration but only added to the aesthetic appeal. 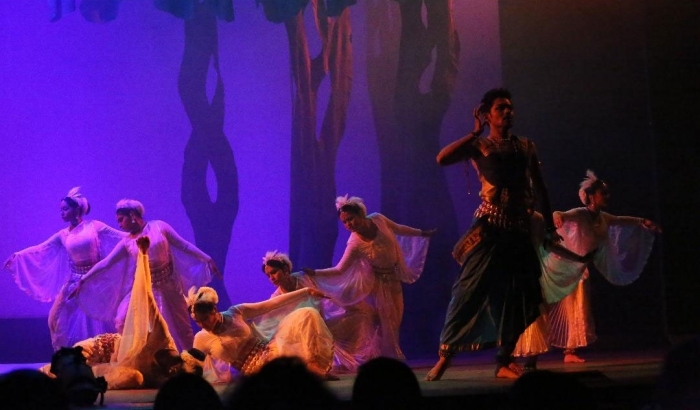 Excellent choreography by Sharmila and costumes by Aloka D Souza and Vijaya Kumar were clearly the highlights of this gripping ballet and the music ensemble made it pleasing to the ears. The focus was more on the group formations on the stage rather than on specific movements. Praveen D Rao used various instruments like sitar, flute, violin etc as well as the traditional mardala, the main percussion instrument for Odissi. Hansika had 25 dancers. "Odissi has lyrical, graceful movements, and comes closest to Western ballet," says Sharmila Mukerjee. The movements of the swan are graceful and suit the talented Odissi dancers in terms of body language which was quite evident at the show. Proceeds from the donor pass contributions went to the C Krishnaiah Chetty Foundation which supports four primary government schools in collaboration with Rotary Club of Bangalore. It was vintage Manju Bhargavee at her best when she put out a dance drama, 'Sri Lalitha Nrityarchanam' in Bengaluru recently. 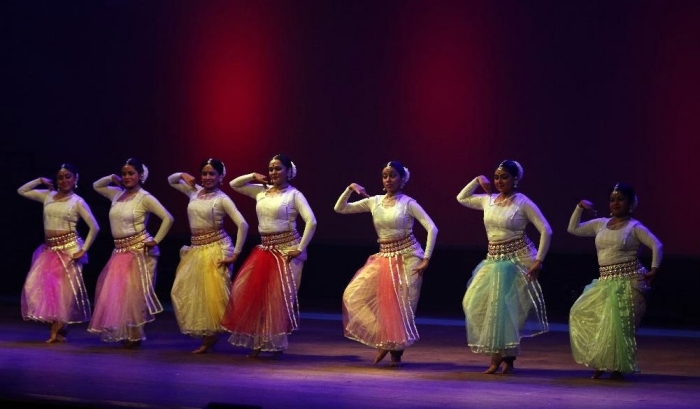 It was a group production and the surprise element was the inclusion of Kathak dancer Hari as one of the performers. According to Manju Bhargavee, Lalitha in Sanskrit is soft or smooth and in Telugu it is Mruduvu- Naazuk. "Out of the sixty four 'Kalalu' (Arts), five of them are called 'Lalitha Kalalu.' They are poetry, music, drama, painting and sculpture. These five are independent of each other. However, dance is the combination of all the Lalitha kalas. The dancer went on to explore the energy beyond time and space and she did it with aplomb, in slow motion. The mystic piece also included Manju Bhargavee's delineation of Pranavanada or Om. From there she goes on to explain the three types of energy: Icchashakti- energy of desire, Gnanashakti- energy of knowledge and Kriyashakti- energy of execution. These three energies were converted into three forms - Icchashakti converted into Brahma, Gnanashakti into Vishnu and Kriyashati into Shiva. In three wonderful sequences each of these energies were brought out with charm and grace. She finally went on to explain the geometric design of Manidweepam called 'Shri Chakram'. By worshipping the Shri Chakram, we derive the energy from the divine mother, Lalitha, the presiding deity in Manidweepam. 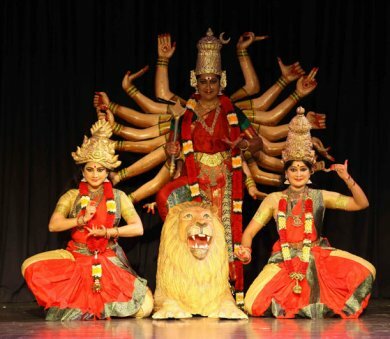 Through Sri Lalitha Nrityarchanam, an effort was made to realise Sri Lalitha through dance. The concept and choreography for the complex piece was by Manju Bhargavee herself. One felt a little explanation in between the various sequences would have helped better understanding of the production. Apart from the high voltage dancer Hari, there were also Veena Nair and Dhanya Nair as co-dancers. G. Ulaganathan is a senior writer and journalist based in Bangalore.